For over twenty years, dazzling costumes, white plumed horses and the thrill of a rodeo arena would adorn Elaine Kramer’s life as one of America’s most famous roman riders. 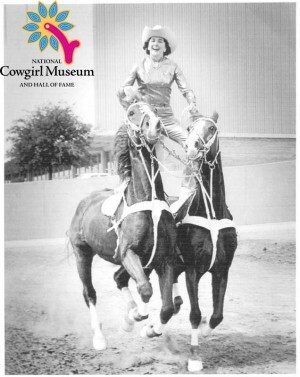 She performed her roman riding act with the Flying Valkyries of Palm Springs, California in 1955 and went on to join Jinks Hoglan’s All-Girl Review where a team of women trick rode and amazed rodeo audiences up and down the East Coast. In 1957 she went to Pontiac, Michigan, where she performed and taught children to Roman ride. She was at the height of rodeo stardom when she retired her horses in 1972.